A milestone in modern research on the harmony of the spheres. Is the solar system ordered, or is it simply the result of random and chaotic accidents? This book takes us on a powerful and compelling journey of discovery, revealing the celestial spheres’ astonishingly complex patterns. The movements of the planets are found to correspond accurately with simple geometric figures and musical intervals, pointing to an exciting new perspective on the ancient idea of a ‘harmony of the spheres’. Hartmut Warm’s detailed presentation incorporates the distances, velocities and periods of conjunction of the planets, as well as the rotations of the Sun, Moon and Venus. Numerous graphics – including colour plates – illustrate the extraordinary beauty of the geometrical forms that result when the movements of several planets are viewed in relation to one another. In addition, the author describes and analyses the concepts of the ‘music of the spheres’, with special consideration given to Johannes Kepler’s revolutionary ideas. Current scientific beliefs about the origin of the universe and the solar system are explained, enabling the reader to understand fully how Warm’s remarkable research supplements contemporary materialistic views of the cosmos. An appendix includes his mathematical and astronomical methods of calculation as well as detailed discussion of their accuracy and validity based on modern astronomical algorithms. HARTMUT WARM, born 1956, is a civil engineer and independent researcher in astronomy, geometry, the history of harmonics and musical aesthetics. He has taught, lectured and published widely on these and other subjects, and in particular on his discoveries relating to the solar system and its inherent order. He lives in Hamburg, Germany. 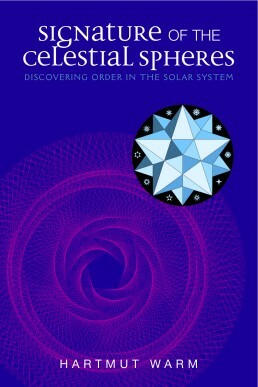 … one thing is for sure: With this book the debate on the harmony of the spheres has once again been sparked off.